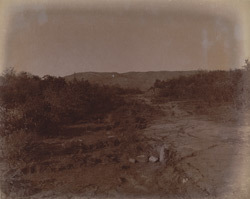 Photograph of the shell inscriptions at Rajgir, taken by Alexander E. Caddy looking south in 1895. Although difficult to make out in this photograph, similar inscriptions have been found all over northern India. Caddy states in his notes from the time, that the inscriptions, "Are said to be the marks of the hands and feet of Jarasandha and Bhima, who fought together until the former was slain.'' This clearly indicates a ritual significance for these markings, yet they have not been deciphered. An understanding of their meaning is essential if we are to assess their religous significance or date precisely. At present, their distribution in relation to contemporary structures and nearby cart or chariot marks, gives a tentative indication of a fourth or fifth century AD date. Rajgir is well known for it's association with the Buddha's life in the fifth century BC, yet we should not forget that the city was still occupied in subsequent eras, as shown by these inscriptions.